I was hoping someone could point me in the right direction in finding out more info on my great great grandfather David McGimpsey. I have found his marraige details, but cannot find any bith details, I did however recieve this from a family member, and was hoping I could possibly find out more details from his military records. Any suggestions on where to begin or where to look would be greatly appreciated. I have had a look on forces war records but nothing seems to be matching his regiment number there. As you can see from the Discharge Certificate he did not serve abroad. This page on The Long, Long Trail covers each Battalion of the HLI. He would most likely have been in one of the home service Units. There is also a museum in Glasgow I believe which might be able to help. EDIT: He may have served abroad but not on Active Service. Interests:The Royal Dublin Fusiliers in general and 10th Battalion in particular.and I probably should add "Irish Brigade" and "Cairo Gang" and "The Auxiliaries"
what does his marriage cert say? was the family from Northern Ireland or Scotland? 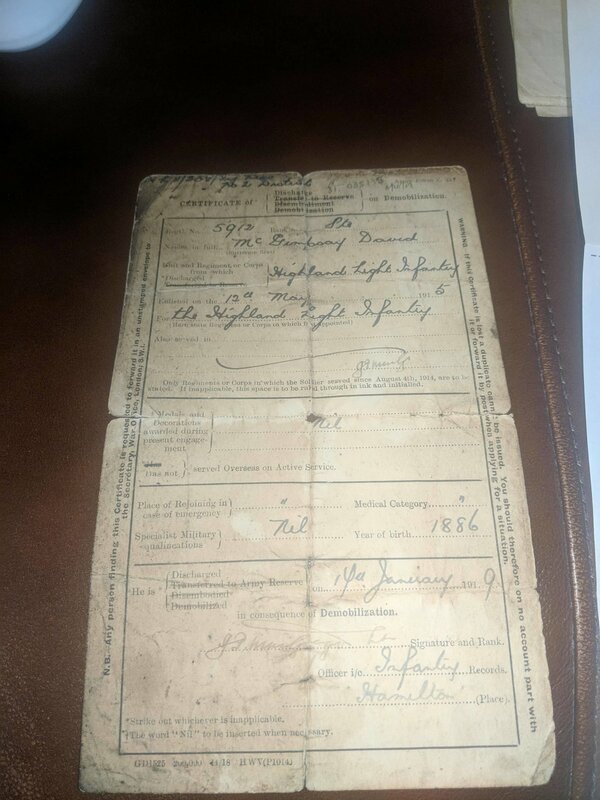 If he's Scottish and his year of birth from the Demobilisation Certificate is 1886, it should be easy enough to find his Birth Certificate on Scotlands People. Interests:Wirral soldiers, Cemeteries, & War Memorials - - - and walking the dogs. Much better to concentrate on 'Ancestry' or 'Find My Past' (in my opinion). Ancestry have some service papers for a David McGimpsey. No idea if it's him, but there can't be too many of that name. There is also a Family Tree on Ancestrey (the Muckle Family) with a David McGimpsey born Newtownards in 1887. Several McGimpsey men are named on the memorial at the link below, are any related to you?